Georgian chanters are sick of being mixed up with their Gregorian counterparts. Despite a longer history, survival through multiple dynasties that sought to suppress them, and their advanced ‘polyphonic’ chanting style, they feel there’s a lot the world still needs to know about the ancient art form. Men of the West are a Georgian chanting group that are masters of the craft, but instead of just reciting orthodox hymns and traditional folk songs, they have taken a humorous approach which will be on display in their show Goodbye and Hello: The First Comeback Tour, hitting Circus Theatre at FRINGE Central from Sunday, February 10 to Wednesday, February 13. 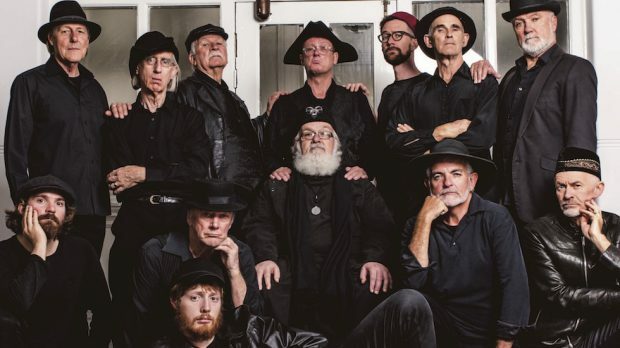 BRAYDEN EDWARDS caught up with Men of the West to find out the fascinating story behind Georgian chanting, and the fun night people can look forward to at their shows this FRINGE WORLD season. So I’m guessing Georgian chanting was named after some guy named George and Gregorian was named after a Greg… right? Right?! What was it about George that made you want to side with him? Gregorian chant, also called plainchant, is an unaccompanied medieval sacred song of the Catholic church, usually accredited to the late 6th century Pope Gregory I. He was actually a pretty cool Pope, widely admired and the patron saint of musicians, singers, students and teachers. Georgian music, however, is much older and comes from the country of Georgia, in the Caucasus region at the crossroads of Eastern Europe and western Asia. The patron saint is Saint George of dragon fame, and as well as claiming to have invented wine 8,000 years ago, Georgia is also famous for its ancient traditional songs in many parts. And what about the style? I’ve heard Georgian is ‘polyphonic’ as opposed to ‘monophonic’. What’s the difference here? Yes, Gregorian chant is a single line of music (monophonic) as opposed to Georgian music, which is polyphonic, usually in three parts. Maybe it’s something to do with living in the high Caucasian mountains, but Georgians have been singing traditional polyphonic songs for thousands of years. In fact, a Georgian folk song was one of the 27 musical pieces chosen to represent the music of planet Earth when the Voyager 2 was launched into space in 1977. So, Georgian music is pretty special, and great fun to sing as well. Georgians also like to combine wine and song and are noted for their banquets, called “supras”, where there are lots of toasts and speeches followed by traditional songs. Apparently the Roman Catholic Church weren’t fans of polyphonic chanting as they feared it would distract the congregations. Is it true you are a disruptive bunch? Well, Georgian song is very diverse and not just religious. Although Georgia was the second country to adopt Christianity in the fourth century, and has some exquisite sacred music, Georgians also like to sing traditional love songs, working songs, horse riding songs and laments for fallen warriors, amongst other things. They have a very long and proud history and have been influenced by classical Greece, the Roman Empire, Byzantium, Persia, and the Russian empire, but have maintained their own distinctive language, music and culture. Oh, and Stalin was a Georgian, although he murdered lots of his own people. You’ve certainly made the ancient art of Georgian chant a lot of fun in these Men of the West shows. What can people look forward to if they come along? Plenty of fun and variety. Expect to be thrilled one minute by the rich resonant tones of males in grand full voice, and then enchanted by an exquisite and ethereal sacred song in three part harmony. We hope to make you laugh and also move you to tears – you can’t ask for more than that!